Uses: Health Care Colors: Gray/White, Walnut Lengths: 5 panel 9'-5", 7 panel 13'-1" Heights: 6'-0"
At a recent visit to a local hospital, one of our sales representative found a Screenflex Room Divider in use. On that particular evening, the hospital was experiencing an overflow of patients needing care in the emergency room. In order to accommodate the patients, Screenflex room dividers were used in the hallways to create private rooms for those needing limited care. 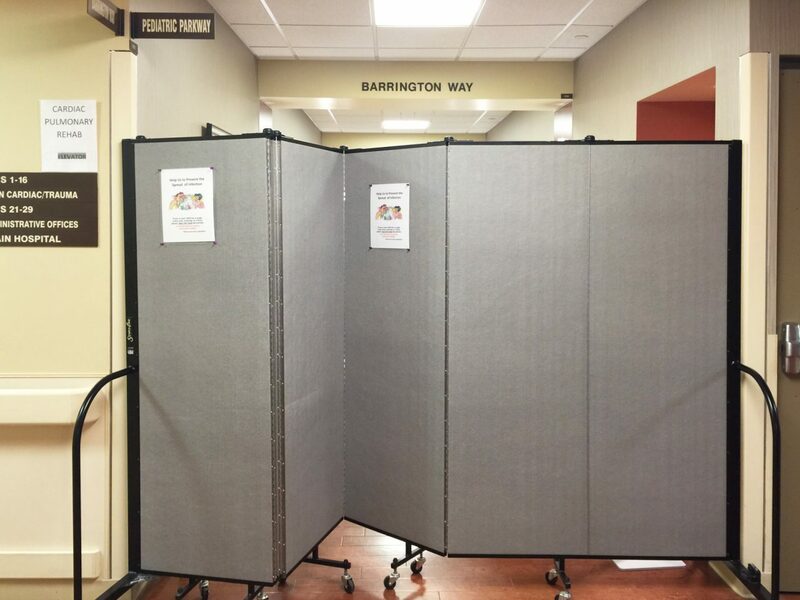 Since the hospital has room dividers in a variety of lengths, they were able to use their room dividers to fit any size hallway or room. By simply creating a kink in the room divider panels, the room divider was able to extend from wall to wall in the hallway for complete privacy. During recent construction in the hospital, the dividers were used to guide patients throughout the hospital while protecting them from construction debris. Choose the best room divider for your facility by selecting a color option from our 38 colors and 36 room divider sizes.